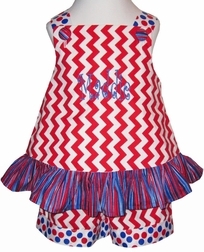 She'll be darling for Memorial Day or the 4th of July in our girl's patriotic 4th of July outfit in red chevron with dots ribbon. 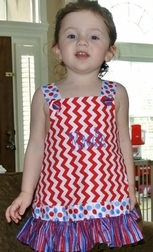 We start with the red Chevron fabric and fashion either a dress or swing top with it. The shoulder straps are made with white grosgrain ribbon decorated with red and blue jumbo dots. The same ribbon embellishes the bottoms of the trousers. 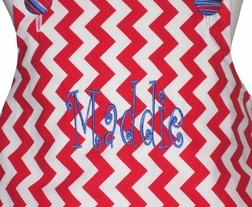 A bright and fluffy red and blue striped fabric ruffle decorates the hem of the dress/top. The dress also has the jumbo red and blue dot ribbon just above the hem ruffle. Wonderful all year, but especially for the 4th of July events you are attending and just to show how patriotic your little one is!